Happy holiday gift knitting time to all, and to all lots of wool!! 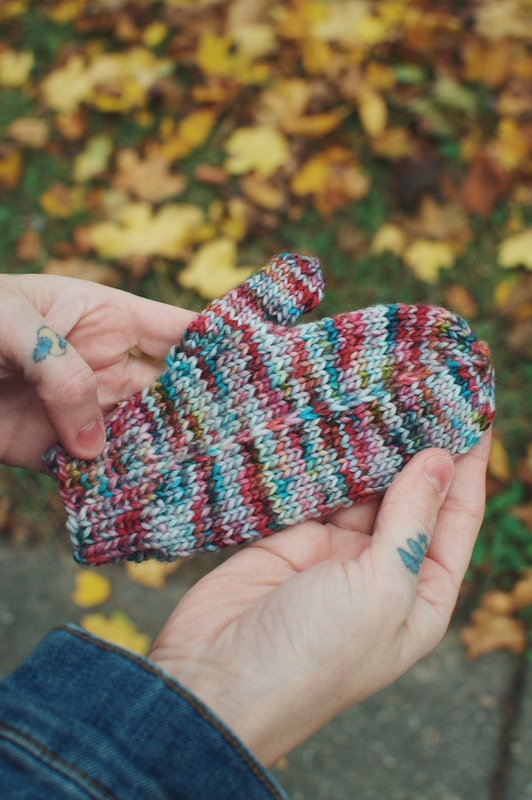 I am pretty stoked about today's pattern release - Tinsel Mitts!! A few months ago I was chatting with my friend, Heather, from House of A La Mode, about her stunning hand painted yarns. This woman has got an eye for color and knows just how to splash it on beautiful pillows of plied wool! She was mentioning ideas for some holiday colorways and how she wanted some simple, approachable patterns to accompany them. I knew immediately - mitts! Everyone needs a good mitt/mitten pattern in their knitting toolbox. First off, we all like warm hands. Secondly, using up less than a skein of yarn and knitting up in just a couple evenings, they make the perfect gifts for everyone on your list! And I mean everyone - I kept the look simple, modern, and unisex with a faux seam running up the center of the front and back. I included all the different styles one might want - full on mittens, convertible mitts, and fingerless mitts! At first, I selfishly knit them up to fit - well...me! But once I shared a sneak peek on Instagram, I immediately began getting inquiries - would their be children's sizes? Men's? Small women's? Genius! Mitts for everyone! I got back to work and added 4 more sizes (my husband and daughter are quite pleased)! I hope you enjoy knitting up these mitts as much as I did!! You can find House of A La Mode yarns the first weekend of every month in the Citizens of Textile pop-up shop! Check back at the end of this month for an interview with Heather! !